~ My books are all in boxes still. Over five weeks later. I have a good reason. Sort of. Anjin and I would like to get new bookcases, ones that match, for the living room--which I will probably start calling the library just because. ~ We've moved a couple of the old bookcases upstairs to the loft area where Anjin's comic books and graphic novels are now housed. ~ There are three bookcases in the master bedroom. One in Mouse's room. ~ We have a lot of books. ~ I am still reading Bloodline by Mark Billingham. Since starting back at work, I am finding it difficult to squeeze in any reading time. ~ I guess it is good then that my books are all in boxes. No guilt when they are out of sight. ~ Baby talk dominates most of my conversations these days. I'm one of those people who now talks about sleep schedules, developmental milestones, who she looks like more (me or my husband), feeding habits (including breastfeeding stories), and the consistency and color of bowel movements. ~ I have not yet dropped my pronouns in adult conversation but I can see it happening. ~ Did you notice how I couldn't avoid bringing up baby topics? I told myself I wouldn't do that. That about sums up my Tuesday thoughts. 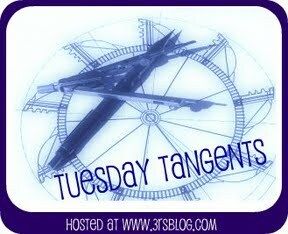 Do you have any random tangents you'd like to share? On a different note: I have been toying with the idea of having you ask me questions I can answer here on my blog during the month of July, just in time for my blog anniversary. I'm pretty sure this will mark my 5th year of blogging, but I can't remember off hand. I worry though no one will ask anything. What do you think? I am actually getting pretty good at baby talk. I don't have kids of my own and don't really plan to ever have any, so it can be interesting... It's being around babies and things that I am not so good at. I prefer when the person I am talking to can sort of talk back. I am sure people will ask you questions for July! You will probably have more than you can handle. That sounds like a really cool idea to me! I haven't seen anything like that on any of the blogs so it would be unique. You might just start something! Go for it! I so admire your restraint in not ripping open the boxes full of books when you first arrived, and I admire it even more that you are going to be giving some to the library! I really need to prune and sort, but I just can't seem to make myself do that! And also, if you did decide to answer questions, I would totally ask one! I knew Chuck and I were in full-swing parenthood when he yelled at me from the changing table one day, "Hey, really good poop here!" It changes everything, but it's soo good! I've done the question thing once or twice; I didn't get a lot, but people seem to like the opportunity to express their curiosity. I think it would be a good way to mark your Blogiversary. I'll start thinking of something to ask you :-)! I'd really like a couple of new bookcases too, but I don't have a new house as an excuse right now! Between what you said here and Sunday's post, it sounds like you're all getting adjusted fairly well. I remember the days when our little one dominated our conversations! They're special days - enjoy them while you can. I love the baby talk!! I think it's wonderful that mouse will be growing up with books surrounding her!! I love it when bloggers ask people to ask them questions! It's so hard not to talk about babies and breastfeeding and labor, etc. once you've been through it. I love getting together with other moms and sharing all of those stories. LOL! Please keep talking babies! It makes me feel less bad/guilty for doing so. ;) Plus I love hearing about it. Well, if I'm 4 years old then you must be 5 (unless you're older!!). ;) I'm sure I can think up some questions! I imagine talking about babies is somewhat like working out for me. Your life now revolves around a bundle of joy and you can't stop talking to her, my life revolves around my workouts and I can't seem to stop talking about them. lol! I love the idea of answering questions about yourself in time for your blogaversary. I'm horrible at coming up with questions but I love the idea and would enjoy reading the answers (and questions). I think you're doing very well with your baby girl and organizing things around to make everything else work. I am getting very limited reading time too and if you noticed, I am not blogging much about books. For one, I'm still on a book ban and then there's the time constraint. Coming up soon would be my studies so it's challenging times ahead!